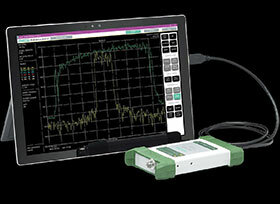 Anritsu introduced the Spectrum Master MS2760A family of ultra-portable, millimetre wave (mmWave) spectrum analysers for verifying high-frequency designs, including those used in 5G and E-band applications. The MS2760A’s size allows it to be placed in a technician’s pocket, while its continuous sweep ability and USB-powered form factor using a tablet reduces the amount of equipment a technician must carry. For R&D and test engineers in lab environments, the MS2760A conducts essential spectrum measurements, such as spectrum analysis, channel power, adjacent channel power, spurious emissions and occupied bandwidth. Users can make measurements directly at the DUT, unlike benchtop models that require cables that can add loss. Its ability to conduct sweeps from 9 kHz to 110 GHz also improves measurement confidence. Available models support the 32 GHz, 44 GHz, 50 GHz, 70 GHz and 110 GHz frequencies. A 90 GHz model is also available for countries where an export licence is required for analysers above 90 GHz.